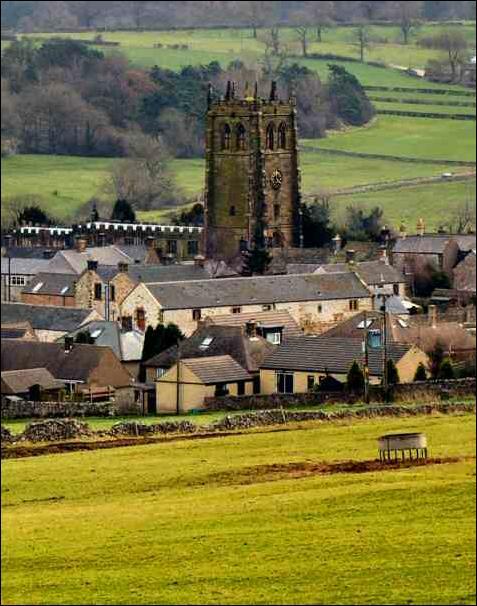 Surrounded by glorious countryside, the ancient village of Youlgreave winds its way carefully along a narrow limestone shelf, between two of the area’s loveliest valleys. Bradford Dale to the south drops sharply down with pretty little cottages and their gardens clinging to the side of the valley; a little further away to the north on the other side of the hill is Lathkill Dale, considered by some to be Derbyshire’s finest dale. The long, narrow village street runs for about one and a half miles along almost the only level ground available; the footpath being lost altogether by the church, where pedestrians, who do not want to run the risk of getting run over, walk through the churchyard. Apart from the narrow road, one problem visitors have is knowing how to spell the name. The sign on the western entrance to the village says ‘Youlgreave’. A quick check on the Ordnance Survey agrees, but the post office says ‘Youlgrave’. Local people use the latter spelling, which is how the name is pronounced. It was recorded in the Domesday Book of 1086 as ‘Giolgrave’ and according to research there are over sixty different spellings of the name! 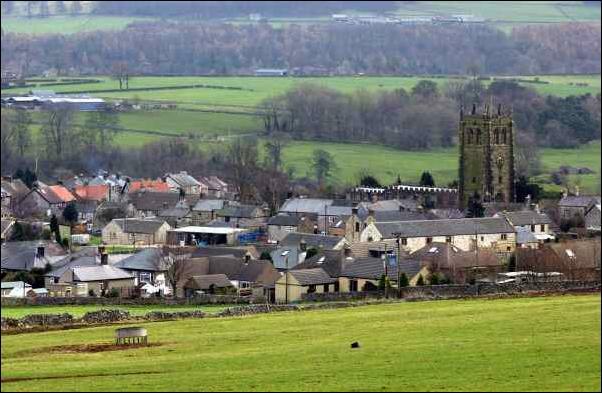 The precise origin of the village’s unusual nickname of ‘Pommy’ is not certain either, but is probably connected with the local band. When instruments were first purchased, only a few members of the band knew any music, so parades were not particularly tuneful, but more of a repetitious ‘Pom, pom, pom’. Another version of ‘Pommy’ is of a pig resting on a wall serenading the band as it passed by! An important centre for lead mining, the Mawstone Mine even re-opened after the First World War in anticipation of increased demand, only to cease production permanently in 1932. An explosion in that year killed five of the six miners working underground and three of the rescue party were killed by carbon monoxide poisoning. In the centre of the market place is a huge circular water tank or conduit head, known locally as ‘The Fountain’, which since 1829 has supplied soft water to the villagers, initially at an annual charge of 6d. It was built following a campaign by the ‘Friendly Society of Women’, who demanded a cleaner, healthier and more efficient supply of water. It certainly was more efficient than carrying the water on the tortuous journey up from Bradford Dale. The village still has its own private water company, but prices have increased! Well Dressing, or ‘tap dressing’ as it is sometimes called was first introduced when water was piped to The Fountain, and it was decorated in thanksgiving for the improved water supply. Originally the water was carried in iron pipes 1106 yards from a spring on the hillside across the dale, just 25 feet higher than the conduit. On the Saturday nearest St John the Baptist’s Day in June every year five wells are dressed to a very high standard and are amongst the most widely admired in the county. The parish church of All Saints is a magnificent structure, second only in size to Tideswell in the Peak District. Norman in origin, the font with its projecting stoop is unique in this country. Do not miss the small intriguing figure of a pilgrim with staff and wallet, reputedly carved by a travelling friar in return for hospitality. An interesting entry in the churchwarden’s accounts for 1799 ‘Dog whippers had to be paid’, for whipping dogs out of church during divine service. Near the church are some rather grand Georgian houses. Further west is The Old Hall, a distinctive looking Manor House, said to be haunted, dated 1656 according to the datestone but may be earlier. At the rear is Old Hall Farm another charming stone built house of about 1630. Tiny Thimble Hall, ‘one up and one down’, situated in the market place is the smallest hall in the country; it attracted considerable interest when sold in 1999. Nearby, a three-storey Victorian building used to be the Co-operative stores and still carries the advertising, but is now a thriving youth hostel. 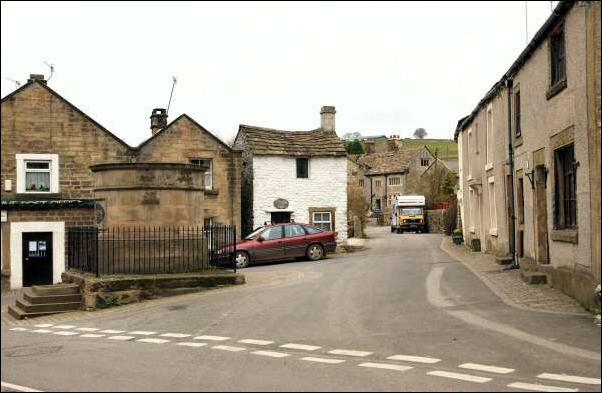 As keen cinema fans will know, the store was featured in the film’ The Virgin and the Gypsy’, along with much of the rest of the village, which was referred to as Congreave in the novel written by D H Lawrence. There are three pubs, The Bull’s Head, with a superb carving over the courtyard entrance, The George and the Farmyard Inn with the amusingly named apartments to the rear of Cow Shed, Sheep Pen and Pig Sty. The Village is well served with a variety of shops including a post office and gift shop. Football and cricket are played at the Recreation Ground, where county cricketers have played benefit matches in recent times. 11. Hollywell Lane Tearooms - now closed. Derek Topp Gallery, Rowsley (Tel. 01629 735580) offers a wide range of contemporary applied art, everything being hand made in Britain and of the highest quality. Open daily. The Farmyard Inn (Tel. 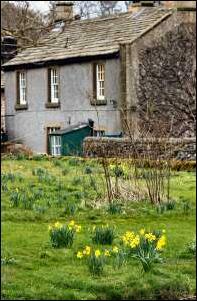 01629 636221) as its name implies used to be a farm and was converted to an inn in 1829. The beamed ceilings and open fireplace give it an old world atmosphere. Food is served daily at lunchtime and in the evenings from Tuesday to Sunday. Caudwell Mill Tea Rooms (Tel. 01629 733185) have an excellent reputation for food and serve both hot and cold meals. If it seems a little like sitting in church there is a reason. The seating and serving counter have both been salvaged from Crich Carr Chapel when it closed. Normally open daily please ring for details. 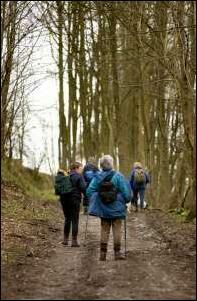 Much of this delightful walk is along the banks of the Lathkill and Bradford; both of these rivers flowing entirely through limestone country are famous for the purity of their water. After leaving Youlgreave the walk crosses open countryside to Meadow Place Grange. The original grange farm belonged to Leicester Abbey from the 12th century until the dissolution of the monasteries in the 16th century. Soon after leaving the farm, Lathkill Dale is reached. It is well known for its aquatic life as well as being a trout river and the bank sides teem with wildlife. Before the bridge was built at Alport, where the Lathkill and Bradford join, the old Portway forded the river on its journey from Castle Ring to the Iron Age hill fort on Mam Tor near Castleton.